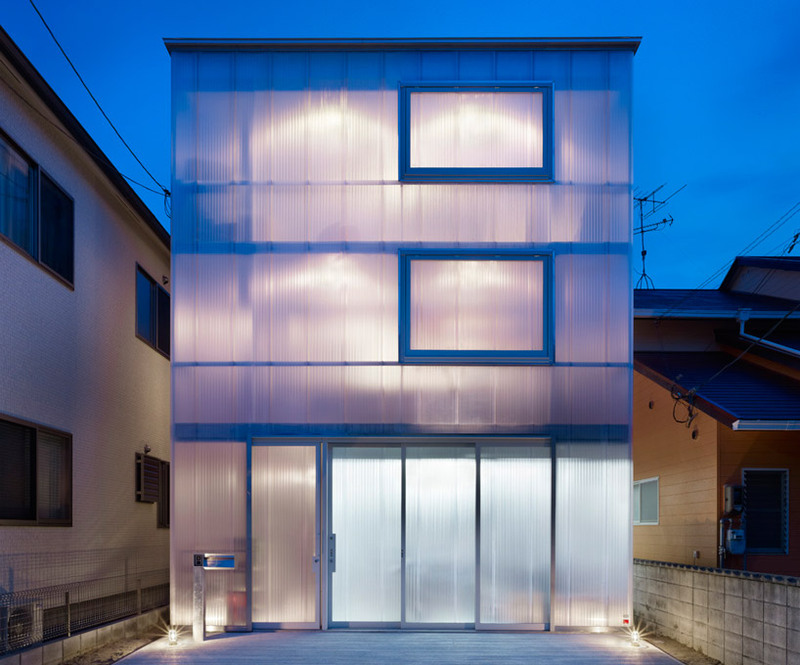 suppose design office is a japanese architecture practice based in hiroshima and tokyo. the firm was founded in 2000 by makoto tanijiri, who was joined a year later by ai yoshida. 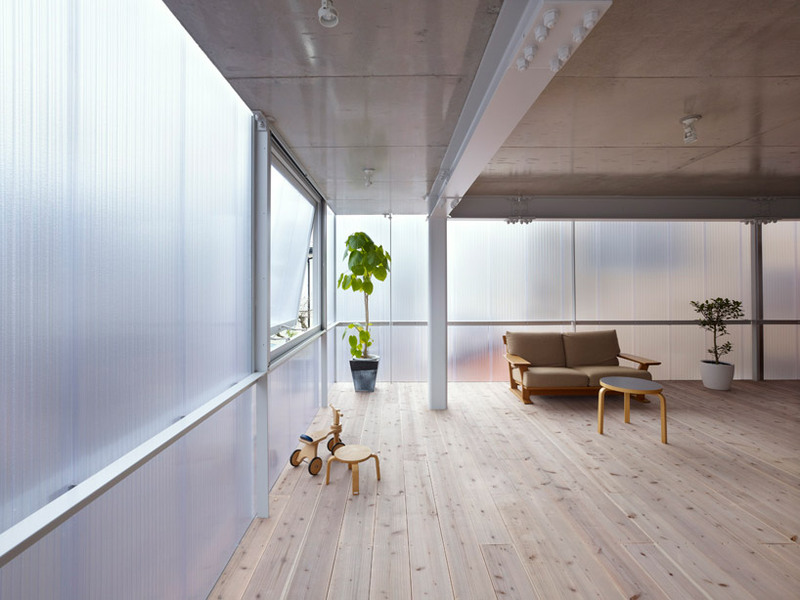 in the quiet residential area of tosuien, in hiroshima, japanese practice suppose design office has recently completed a house for a family withthree children. 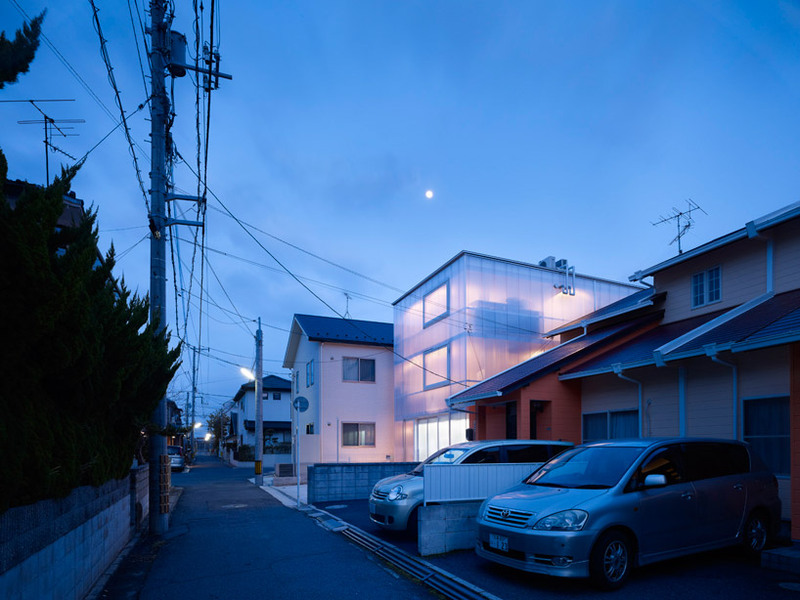 the particular residence offers its originality at first glance: the metal frame structure and overhanging concrete floor planes arecompletely covered in translucent panels like one large light box. an avid collector of motorcycles, the ground floor features ample room fortheir storage, with space for a vehicle on the exterior as the house is set back four meters from the road side. 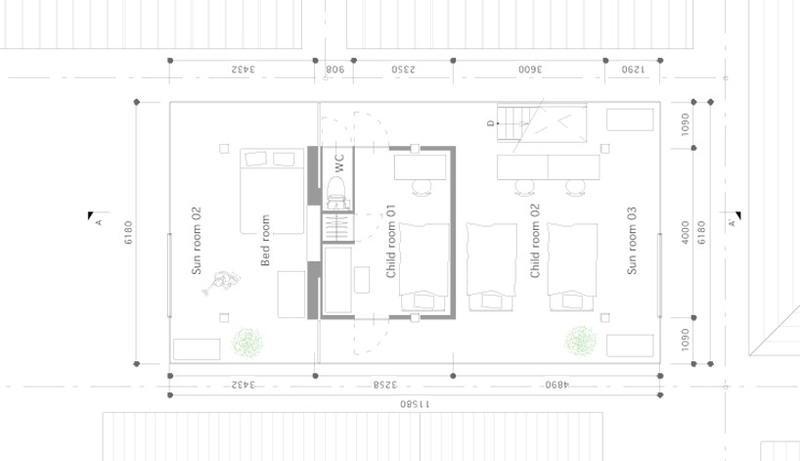 the next level contains the social program – dining and living rooms and kitchen – located partially within a concrete core that hides all the mechanical and plumbing systems, with the final storey left for all the bedrooms. 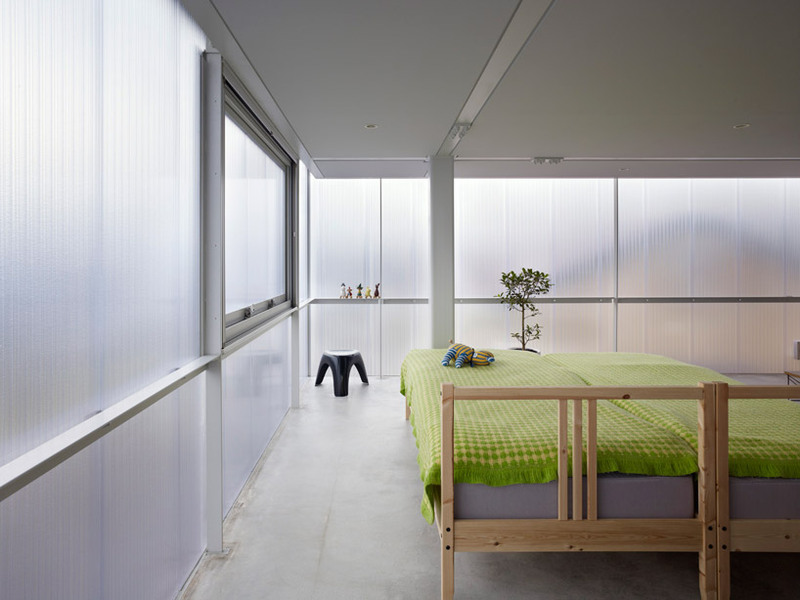 the small corrugations of the plastic panes give a feeling of transparency but maintain a certainlevel of privacy, as the only real clear image exists within about a meter from the skin and is still a bit distorted. the interior is constantly illuminatedby natural diffuse light, with operable windows to provide ventilation. from the inside, the walls become blotched mosaics of the surrounding neighborhood, hinting at the general colors without exposing too much detail. What’s the thermal efficiency or energy rating of that house? 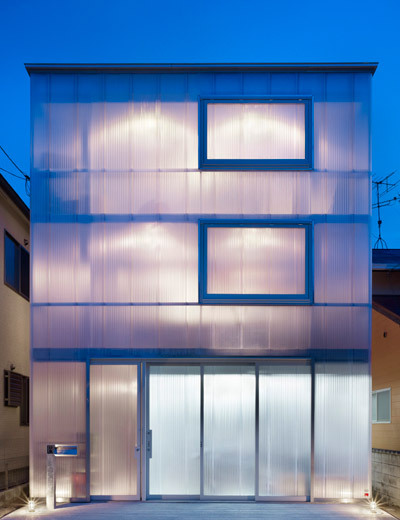 Who manufacturers the translucent panels and are they available in the US? I’ve lived in Japan for 5 years and I can tell you that Japanese constructed homes are by far the most drafty, heat inefficient structures I’ve ever lived in (I’m from the U.S.). Looking at this building I think two things: 1. 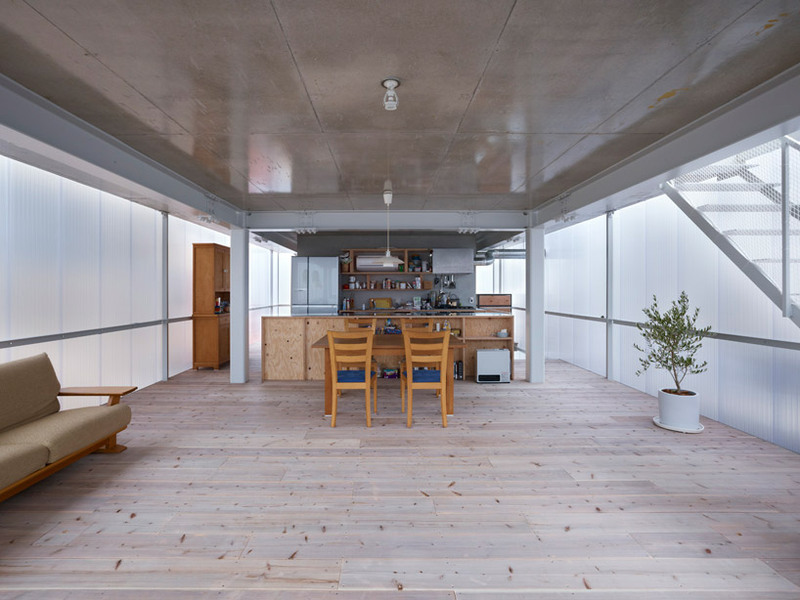 BS, this is probably not the final version, rather a show piece to display their design, the final home will have real walls, or 2. this family will be sick very often, because Japan gets bone chillingly cold in the winter. I would have to agree. I could not be convinced that this house retains heat. If you look carefully at the pictures, there aren’t any heat ducts in the floor or the ceiling. 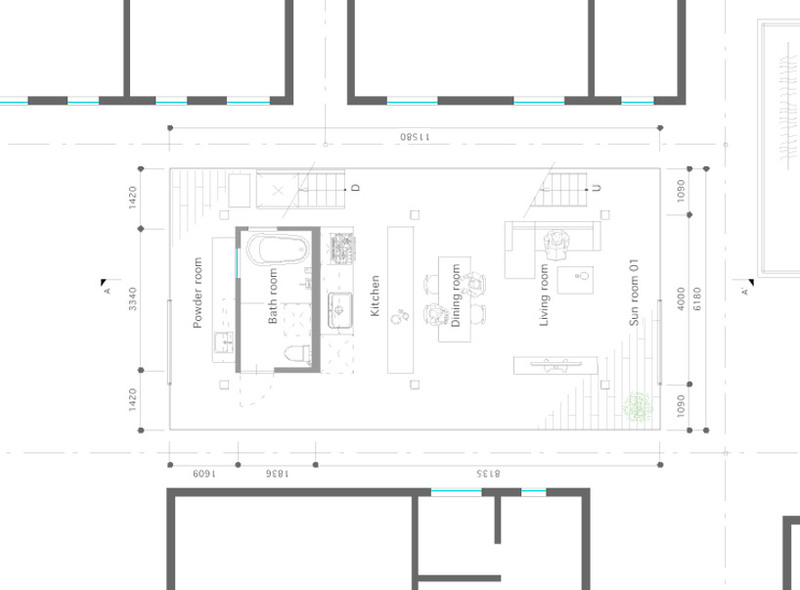 The description doesn’t indicate that the structure has radiant heating in the floor. I would hope that someone is not actually raising a family here. @Andrew, the polycarbonate panels can be R3+ depending on thickness. they are available from many suppliers in the US, they are commonly used for greenhouses. they are not corrugated like cardboard, the surface is smooth and there are vertical/square divisions that make the panels stronger. they can be very clear or very diffuse. Well gaijin san, have you been in any new, manufactured houses by any of the major house builders? Did the owners select double paned windows? Yes they will still sell you single pane windows in Japan. That unfortunately will negate many of the other energy/comfort features of a new house. Most new houses have energy saving features such as fresh air heat exchangers but the new owners are rarely instructed on how to take advantage of them. They use one or two room (the LDK and a bedroom) only heat or cool those rooms, and seal them off from the rest of the house. The stale air exhaust and heat extraction is thus defeated as it is usually in a circulation area such as a hall way or stairwell. The japanese are obviously much more adventurous with their housing, I have no doubt that this is the final version of this project. 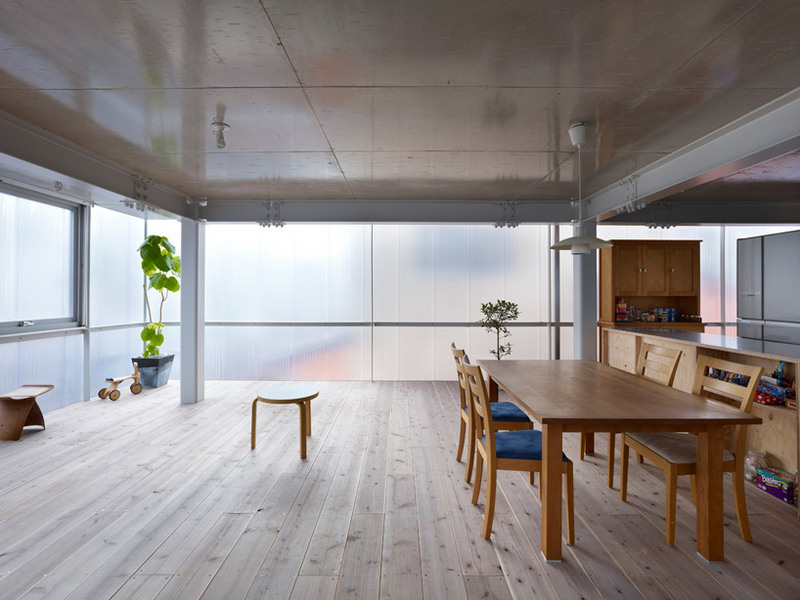 Witness the countless houses in Japan you can find on the internet built of solid concrete or steel frame and sheet steel cladding, with ZERO insulation. this is the corrugated stuff, used in a single layer in a house in Australia. 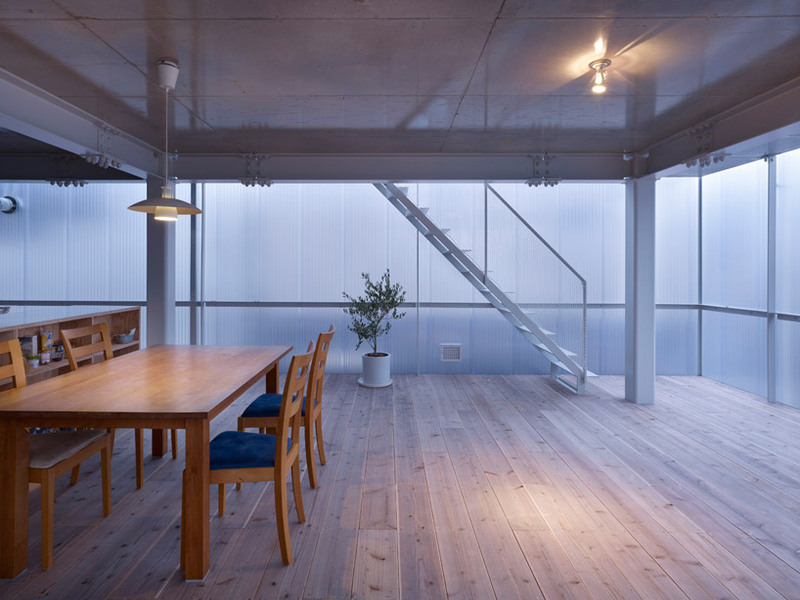 references the metal cladding used in agricultural and mining buildings. very nice effect with the wood strips on the interior. Are you dense, Pamela? Hiroshima is below Osaka and closer to the Equator. It doesn’t get cold there. HVAC The very first photo shows two heat exchanger units on the roof with coolant pipes running into the side of the building. 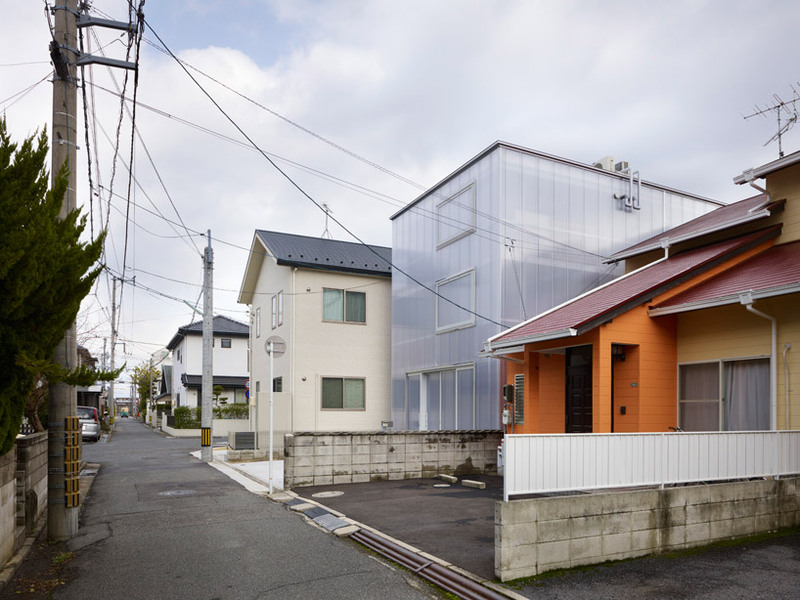 This is how the vast majority of Japanese houses are heated and cooled. I totally agree with Pamela Buckey!!! you tell the truth behind the photos! weather tomorrow in Hiroshima is a low of -2 to a high of 7 degrees C.. so that is cold. unless your a Yak. 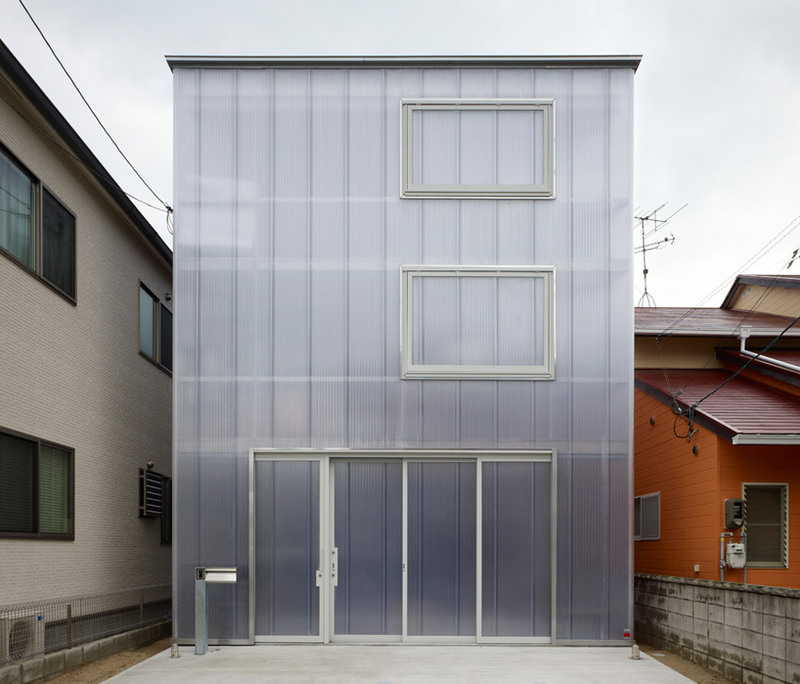 The wall sheeting looks like a celular polycarbonate, thermal efficiency is ok, but if it is only 1 layer, I would not want to be living in that house tomorrow. does look like there there might by 2 layers. The half height walls of my carport are made from this stuff. I imagine you will also hear everything that happens on the street inside that house… And anyone with a little more than a pocketknife can cut his way through these walls in no time… Very burglar-friendly. What an utterly drab and lifeless place to live. You’re worried about it being cold? I wouldn’t want to take off my jacket and stay awhile. 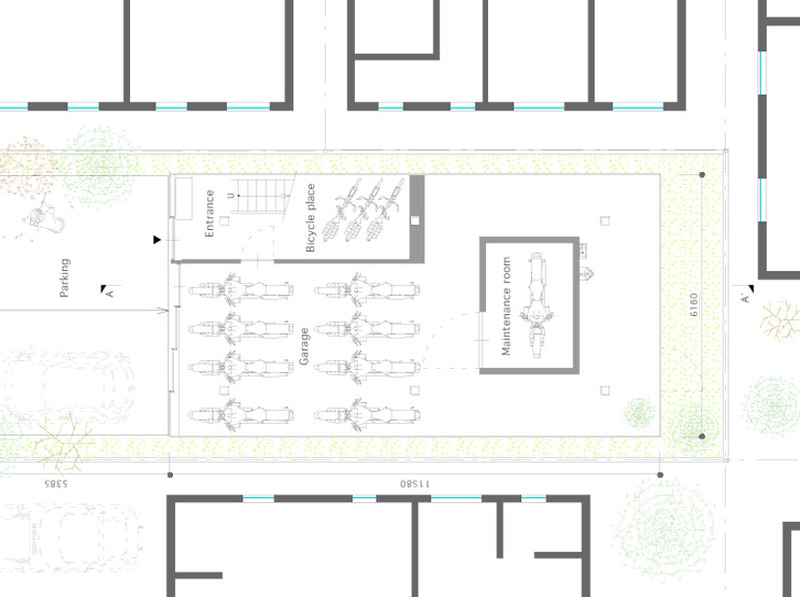 Have we forgotten quality of light and space??? Perhaps it’s nicer on a sunny day. What privacy is allotted the occupants during the evening hours?? Wow, I’ve never had a reaction like this before. 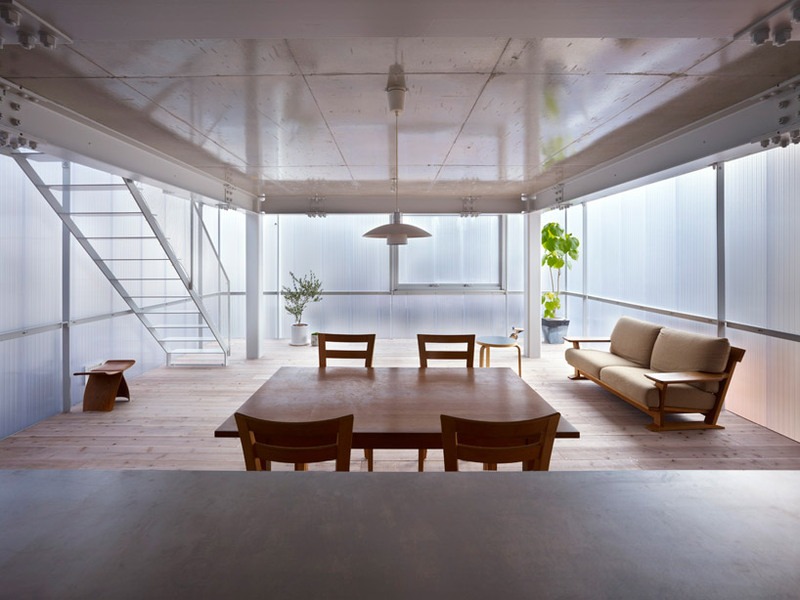 This is a Japanese modern home, for centuries traditional housing in Japan tradeoff the energy efficient house for a more open and translucent architecture, you have to make some sacrifices during winter but enjoy 100% a spring and summer. Traditional Japanese buildings do not use insulation and the sliding doors/walls are made from paper and wood (not a good insulation choice). The heating is often rented or make by mobile units, is common that tenants purchase heating appliances and take them when they move.